OPEC is forecasting a sharp rise in demand for its crude oil in 2015 along with slower production in the US and other non-OPEC countries. Lower oil prices will lead to a slowdown in US shale production and a cut in capital spending. The demand for OPEC crude will rise by 400,000 barrels per day in 2015 to 29.2 million barrels, the Organization of the Petroleum Exporting Countries said in its monthly market report Monday. 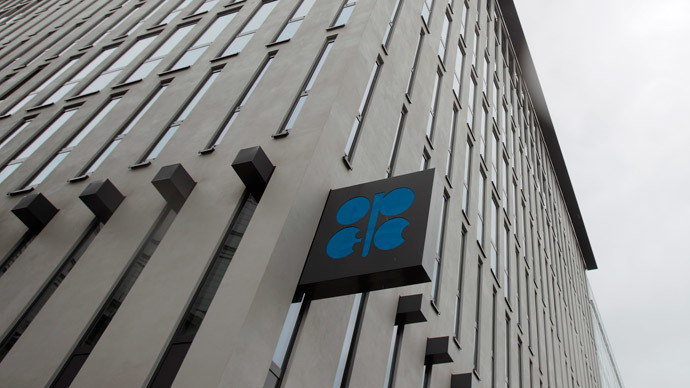 However, it cut the forecast for non-OPEC members by 850,000 barrels per day, down from its previous prediction of a 420,000 barrels per day cut, partly due to a slowdown in the US shale boom. OPEC claims lower prices will also boost consumption. The organization cut the total US oil supply forecast for 2015 by 170,000 barrels per day. That is because oil prices have forced a large number of drilling rigs to shut down, OPEC said. “In 2015, world oil demand is projected to rise by 1.17 million barrels per day, slightly higher than in the previous report”, OPEC said. "Lower non-OPEC supply is mainly due to announced capital expenditures cuts for 2015 on the part of international oil companies, as well as a decline in the number of active drilling rigs in the US and Canada, geopolitics and a heavy annual decline in Russian brown fields,” the report says. The forecast for output in Russia has been also lowered by 70,000 barrels per day from last month. “The country’s oil supply growth in 2014 was lower by 60,000 barrels per day over a year earlier. Part of this reduction was due to the low output of mature fields as well as sanctions by Western countries on Russian oil industries,” according to OPEC. Brent crude oil prices have risen almost 30 percent since hitting $45.19 a barrel in January and were trading above $58 a barrel on Monday. "Crude oil prices started 2015 at a near six-year low, amid plentiful global oil supplies that have pushed oil prices down by almost 60 percent since June 2014, with oil demand growth yet to show signs of accelerating ,”OPEC said. "This time the sharp fall in prices has been mainly driven by excess supply. As a result, lower prices are likely to help to accelerate the pace of oil demand growth this time,” says the report.